Choice Cruising Customized to You! DISCOUNT OFFERED FOR THIS TOUR! It's about you. You are the reason we've used our 80-plus years of travel expertise to design the very best river cruise experience. 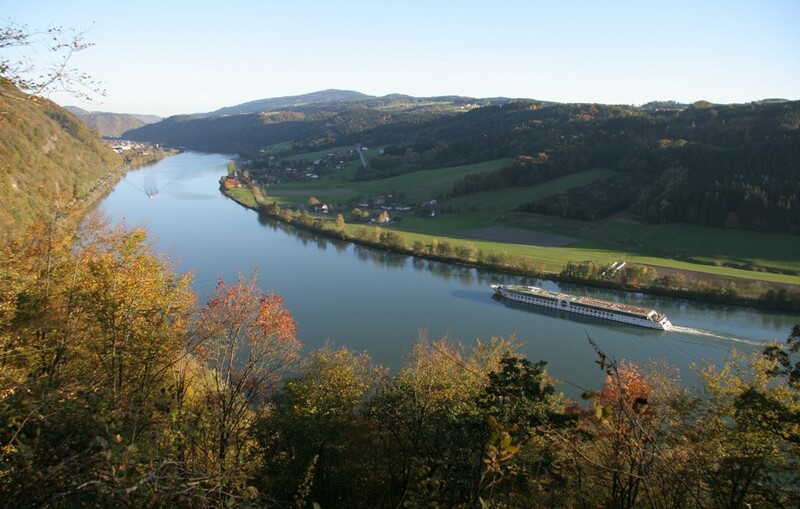 Inspired by you, we've taken everything special about river cruising and made it even better. 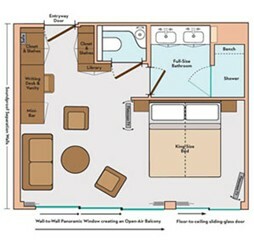 Here are some of the features and amenities you'll experience on board our Avalon ships. 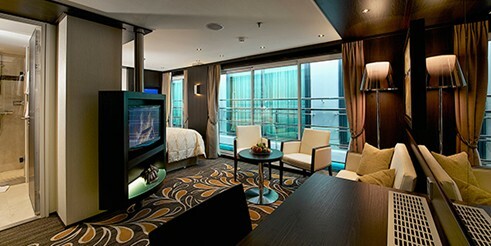 Panoramic windows throughout every ship. Included shore excursions with Local Guide. Personalized room options & excursions. Premium coffees, cappuccinos and lattes. A lounge serving premium spirits. Maintain your routine in the fitness center. Daily early- and late-riser breakfast. Full buffet breakfast with sparkling wine. Made-to-order egg station at breakfast. Complimentary soft drinks with lunch. Al fresco lunches on the Sky Bistro. Four-course dinners with open seating. Nightly choice of appetizers, entrées, desserts or cheese. Complimentary regional wines at dinner. Free soft drinks or beer with dinner. Night Fare served at 10:30 p.m. Remarkable service throughout the cruise. Large bathrooms - showers w/ glass doors. Flatscreen satellite TV with movie channels. Spacious 3-door closets for ample storage. Alternative dinners of light regional specialties and wines in the Panorama Bistro on Suite ShipsSM. Welcome to Budapest, Hungary’s lively capital. The remainder of the day is free to start exploring this exciting city. You may also want to view the EASTBOUND VERSION of this cruise/tour. A brand new kind of ship, the Avalon Panorama set sail in 2011, taking inspired design to a whole new level. A unique 'Suite Ship', the Avalon Panorama was the first of its kind in the industry - with two full decks of suites featuring a Wall-to-Wall Panoramic Window that transforms the living space into a unique Open-Air Balcony. 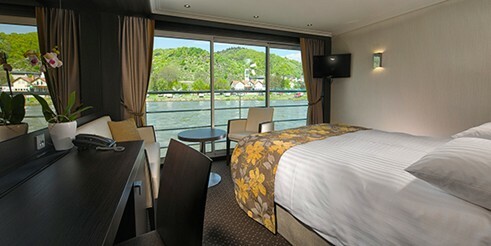 As you cruise along Europe's finest rivers - the Danube, Rhine, or Main - enjoy the fresh breeze and enchanting scenery from the comfort of your suite. 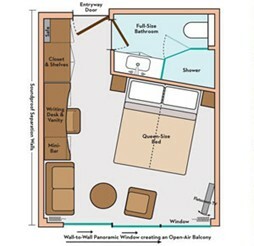 With 200 square feet, the Panorama Suite is more than 30% larger than the industry standard, and it gives you the unparalleled opportunity to wake up each morning facing the magnificent passing scenery. 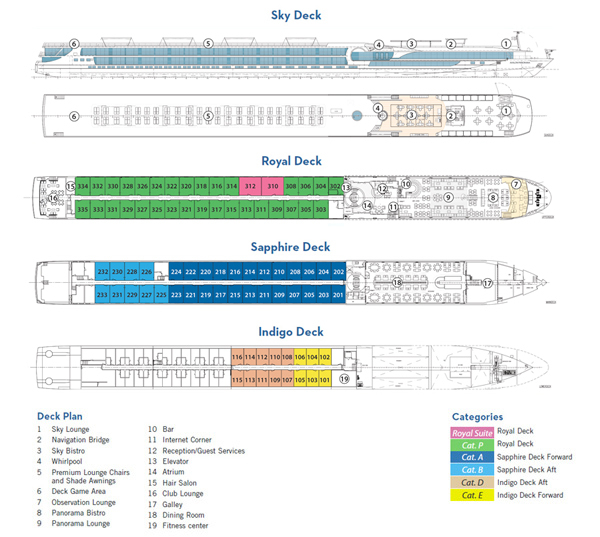 Exciting onboard amenities include an Internet corner and Wi-Fi access, a well-stocked library, an expanded fitness center, and a spacious Sky Deck with premium lounge chairs, shade system, whirlpool, and delightful Open-Air Bistro. There's no better way to cruise in Europe than in the spacious comfort offered on the Avalon Panorama. 2014 is a big year for Avalon, as we expand our fleet of dynamic Suite Ships once again. In addition to the Avalon Poetry II and Avalon Impression, the beautiful Avalon Illumination will grace the waterways of Europe. Like its sister ship, the Avalon Expression, the Illumination features two full decks of Panorama Suites with Wall-to-Wall Panoramic Windows that transform the living space into a unique Open-Air Balcony. Cruise along the legendary Rhine, Main, and Danube Rivers, enjoying fresh breezes and enchanting scenery from the comfort of your suite. With 200 square feet, Panorama Suites are more than 30% larger than the industry standard, affording you the incomparable opportunity to wake each morning facing the splendid passing scenery. Onboard amenities include an alternative dining option in the Panorama Bistro, an expanded fitness center, complimentary Wi-Fi access, and a spacious Sky Deck with premium lounge chairs, whirlpool, and light al fresco lunches at the open-air bistro. Avalon's cutting-edge fleet of Suite Ships will grow by three in 2014! In addition to the Avalon Poetry II and Avalon Illumination, the striking Avalon Impression will grace the waters of Europe's Rhine, Main, and Danube Rivers. Like its sister ship, the Avalon Expression, the Impression features two full decks of Panorama Suites with Wall-to-Wall Panoramic Windows that transform the living space into a unique Open-Air Balcony. With 200 square feet, Panorama Suites are more than 30% larger than the industry standard, affording you the incomparable opportunity to wake each morning facing the splendid passing scenery. 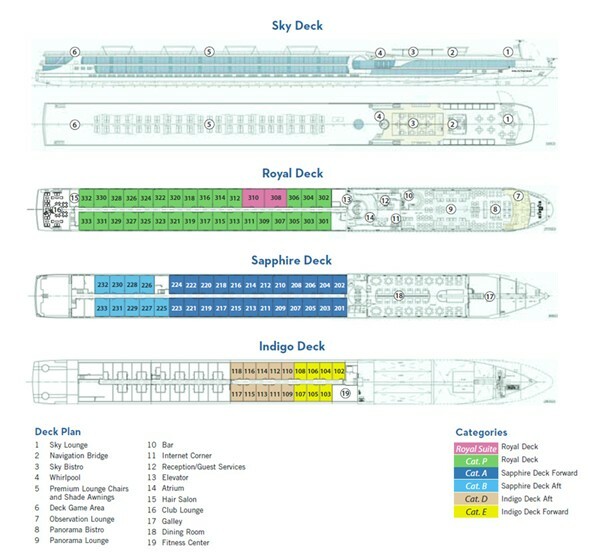 Onboard amenities include an alternative dining option in the Panorama Bistro, an expanded fitness center, complimentary Wi-Fi access, and a spacious Sky Deck with premium lounge chairs, whirlpool, and light al fresco lunches at the open-air bistro. Prices are per person based on double occupancy and are cruise only. We also offer competitive group-based airfares from your home city airport that fit with this particular touring program. We provide an additional agency point-of-sale discount for all Globus, Cosmos and Avalon Waterways tour programs. Offer subject to availability and change without notice. As a full-service travel provider, we can help you in finding your perfect tour at the best price available, today. We've been representing the GLOBUS Family of Brands for over 35 years as a Premier Agency Partner - a designation only awarded to the top tier agencies that are authorized to represent the full Globus Family of Brands. We can take you all the way from your own hometown to some of the most beautiful touring experiences in Europe and then back again - all with the expertise of a seasoned GLOBUS professional representative. When it is important to get it right, you can trust the services of our own professional GLOBUS Certified travel specialists. Please feel free to call us or email us or we would be happy to provide your information via email on the tour form, below. We are available to answer your inquiries in person Monday - Friday (except holidays) from 8:30am until 5:30pm CST (1-877-510-4653 | 817-788-5210). We are available from time to time on the weekends via email to answer your questions. Our typical response time for your email request ranges from 3 hours to as many as 72 depending upon the availability of onsite resources and those of the tour companies and resorts/lodging establishments, as well as any variations you may request from our listed programs. For those inquirers requesting a trip within two weeks, we will give you a priority due to your need to establish an immediate plan. At any rate, we will respond to your requests as quickly as possible and as soon as we have all components of your package confirmable. All tour program rates are based upon double occupancy unless otherwise specified. Thank you for your interest in this quality tour by The GLOBUS Family of Brands! We look forward to serving your travel needs and wants! To request our LOW UNPUBLISHED RATE and availability for this tour please view our scheduled departures listed HERE. Then, email us on the form BELOW and we will provide our private rate back to you by email response or phone call as you prefer it. We have access to the U.S./Canada reservations only for this tour. If you reside outside of the U.S./Canada please contact the closest Globus Family of Brands travel agent in your country of origin. Celebrating over 80 Years of Travel! You may reserve this tour by using our Globus/Cosmos secure server (right) by clicking on any of the "Book Now!" departures. Book Now! - Tour is available to reserve. Not Available - Tour is currently sold out. Please Call - There may be 1-4 seats available but tour is selling out. Please have the names of passengers as listed in each passport available to complete the brief booking process. This online reservations engine will not calculate our additional GLOBUS/COSMOS Preferred LOWER rate. Although this portal will not show or add our discounts, they will be added when we receive your booking and an adjusted quote will be provided by our experienced GLOBUS Family of Brands agent. including our lowest available discount for this tour. Your request will be handled by a responsible and knowledgeable tour specialist that can not only check availability for this particular tour but can further advise you as to other general queries that you may have about traveling conditions, passport/visa requirements, immunization requirements and other valuable information that you may need before making your reservation. We are a full service travel company and we have always catered to the individual traveler and his/her specific needs. We want to get to know you as a valued friend in travel. We are always available with our email service but feel free to call upon us if you have an immediate request at 1-817-788-5210. We use SSL Technology for secure data and information transfer to protect your privacy. Humans still do it best! Traditional Service Values with a Southern Flavor since 1979! 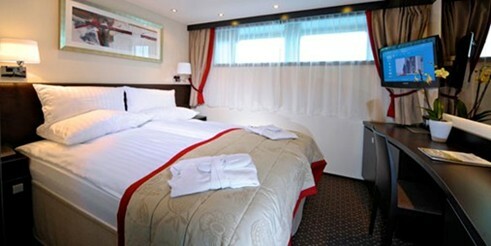 We have always provided river cruisers the most spacious staterooms in Europe. With our Panorama-style Suite Ships, we're not only offering cruisers our award-winning Avalon Deluxe Staterooms, we're featuring 200-square foot Panorama Suites (30 percent larger than the average stateroom) and 300-square foot Royal Suites, offering cruisers even more room to relax and take in 360-degree views of Europe. Inspired by design, our ships are crafted to entice all five senses. Some enhancements, including deluxe woven carpeting, flowers, premium L'Occitane products and scented sticks in our staterooms are subtle. Other offerings, such as Avalon-branded premium bedding (Comfort Collection BedsSM), marble bathrooms as well as a perfect balance of warm interiors, natural lighting and panoramic views are distinctive and unexpected. Combined, all elements provide travelers with a unique feeling of space, freedom and comfort not found with any other river cruise line. 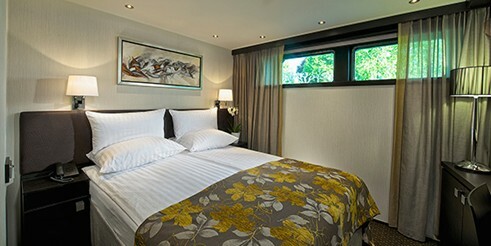 Avalon Waterways offers cruisers an exclusive, premium-bedding suite (Comfort Collection Beds) in all of our staterooms, fleet-wide, in Europe. Comfort Collection Beds provides travelers a choice of pillows as well as orthopedic mattresses, high-comfort mattress covers, European-style duvets, Egyptian super-combed cotton linens, extra blankets and bed configuration options. Peering through the looking glass to determine how we can continue to improve our cruisers on-board experiences, we have invested in the finest bathroom appointments available and such luxury touch-points such as L'Occitane toiletries, quality robes and slippers in each room, fleet-wide. 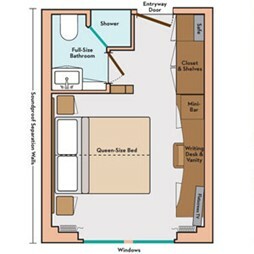 We've also designed contemporary staterooms with the most available storage space, and plenty of "comfort touches" like complimentary bottled water and fully stocked mini-bars. For some cruisers, comfort comes in the form of connection: staying in touch with friends, colleagues and family members while away. Because of this, Avalon has taken great strides to enhance the technology available to guests on ship. In addition to offering them flat-screen televisions, providing a plethora of news and entertainment options, Avalon provides cruisers with FREE Wi-Fi fleet-wide. 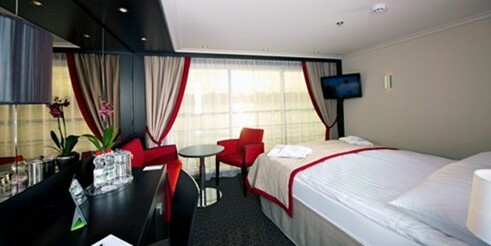 Furthermore, Royal Suites guests will have access to in-room iPads. * iPad is a trademark of Apple Inc.
On an Avalon Waterways river cruise, "included" is the name of the game. Spacious outside staterooms with expansive riverscape views—included. VIP access into the must-see sites—included. Your choice of enriching shore excursions led by Certified Local Guides—included. Wi-Fi access—included. Sparkling wines with breakfast, regional beers and wines at every onboard dinner, and unlimited lattes and premium coffees—included. And we're proud to offer Avalon Choice®, an exciting concept in river cruising that gives you the freedom to personalize so many elements of your cruise. Our Cuisine is Choice - So are the ways to Enjoy it. Avalon dining has always freed taste buds from the ordinary. And now — it frees you from restrictions. At every meal, you'll have the ability to choose from a multitude of dining experiences. All feature the highest-quality local ingredients, hand crafted by true culinary artisans. And all are included at no extra cost. Discovery By Your Design - Cruise Excursions. We've done our due diligence pre-selecting Certified Local Guides who truly are the best in the world. But what you see and the pace in which you see it, is completely up to you. And the best part? Unlike other cruise operators, our preplanned discoveries are included at no extra charge to you. We even provide Nordic walking sticks for active guests looking for an extra spring in their step. Having the most thoughtfully designed, newest ships in the industry isn't the only advantage of Avalon. We tailor experiences too. Our handpicked Cruise Directors and Certified Local Guides in Europe, Asia, Egypt, U.S. and South America are the best in the business. Avalon's inspired, 360-degree, engaging cruise experiences afford travelers the chance to immerse themselves into a destination and culture thanks to award-winning land programs and world-class guides. Our Egyptologists (along the Nile), Naturalists (in the Galápagos), Cruise Directors (in Europe, Southeast Asia, U.S. and China) and special guest lecturers also offer them a vast onboard educational program, giving cruisers the chance to soak in the history and culture of a region as they drift from village to village or island to island. It's not easy to be an expert on everywhere. Thanks to Avalon's relationship with Globus – an award-winning tour company with more than 85 years of experience and 300 support staff on the ground in 65 countries around the world — our cruisers are privy to the best, all-inclusive land programs available. We transform tourists into travelers and storytellers and help them truly experience each destination with guided sightseeing in every port (complete with headsets), daily port lectures, VIP access into key destinations, no waiting in lines and great cultural immersion and storytelling thanks to highly skilled Cruise and Tour Directors. Avalon is also encouraging cruisers to drive their personal enrichment by experiencing ports on two wheels (from the seat of a bicycle). Adding to our already robust roster of activities, we have partnered with bicycle tour specialists in Amsterdam, Lyon, Durnstein, Vienna, and Breisach for optional, guided excursions. Stroll Along Ancient Roads & Feel the Strange Become Familiar. At Avalon, we never lose sight of the reason you're traveling—to see the people, places, and sights on shore. And because we're part of the Globus family of brands, we're backed by more than 85 years in the travel business…which means you'll experience the world in a way that no other river cruise operator can deliver! When it comes to showing you the world, we select the very best guides—professionals who are certified locally in each destination and selected by the Globus family of brands. These Certified Local Guides are recognized for their expertise, enthusiasm, and knowledge of the area. They will lead you on engaging, included sightseeing tours, delivering genuine, behind-the-scenes destination experiences. You'll even benefit from the use of personal headsets for sightseeing, which gives you the freedom to roam through some of Europe's most famous attractions without missing a moment of fascinating commentary. Avalon offers a great selection of optional excursions to help you further personalize your cruise. Whether it's a classical music concert in Vienna, a visit to a French winery, time at the colossal Romanian Parliament building in Bucharest, or a guided bicycle tour through town, with MyAvalon, selecting and paying for your optional excursions before your cruise is a cinch! 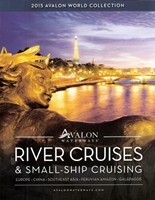 Just go to AvalonWaterways.com/MyAvalon. A Certified Local Guide shows you the destination's highlights in a relaxed and unhurried way. Led by a Certified Local Guide, you'll explore a wide range of sights at a moderate pace. This orientation shows you the must-see sights, with plenty of time to explore on your own. Feel like discovering your destination on your own? Your onboard Guest Services is happy to assist you in making a dinner reservation on shore, getting tickets to the opera or a local cultural performance, or hiring a taxi so you can visit a friend or explore outlying areas. And for a more active experience on shore, consider the complimentary use of a Nordic walking stick. We invite you to come experience a cruise unlike any other. Some big-ship cruise deals sound like an incredible bargain...until you are on board and have to pay extra for everything. On an Avalon Waterways river cruise, "included" is the name of the game – and has been since we came on the scene a decade ago. For thirteen years in a row, Globus has been selected by Recommend Magazine as the best Tour Operator to Europe, and a top finalist for North America, Asia, Latin America and Africa. The brand was also named in Travel Weekly's 2013 Reader's Choice Awards as Best Tour Operator - Europe and 2013 Reader's Choice Awards as Best Tour Operator - Europe, Best Tour Operator - International and Best Tour Operator - Asia and South Pacific. 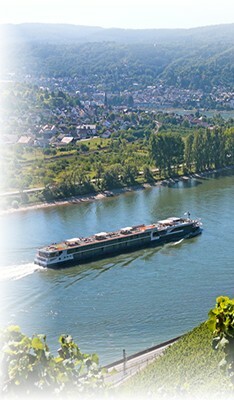 - Is River Cruising for You? ENJOY THE GAME OF GOLF? Check out our SOUTHERN BREEZE GOLF TOURS - golf packages for some fantastic destinations throughout the U.S! Click on the banner below to visit our golf site.